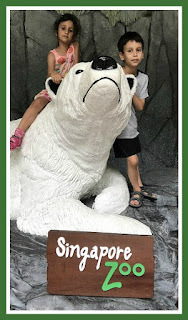 On our recent family holiday to Singapore we were invited to spend a day at the fabulous Singapore Zoo, followed by an evening exploring the attractions of the Night Safari. We arrived at Singapore Zoo around 1 pm, as we were combining our day with the Night Safari. The zoo shuts at 6 pm, and we found that we had just the right amount of time to see everything. There's a small charge for a guided tram ride which you can use throughout your visit. We managed without, but it would be a good idea if you have younger children, as the day can involve a lot of walking. The tram takes a route which covers most of the park, and you can hop on and off at various stations for a closer look before getting back on again. If you are visiting from a cooler climate like us, you need to be aware that it can be very hot and humid in Singapore. Make sure that you pack plenty of water (there are outlets selling drinks around the park, as well as free water machines for topping up your bottles) and wear light, comfortable clothing and shoes. We were lucky with the weather on our visit, but having been caught in a heavy shower and thunderstorm earlier in the week I made note that there were plenty of covered areas for shelter in a downpour! There are also many indoor exhibits which are air conditioned, always nice for a break from the heat. We spent lots of time at the Free Ranging Orangutan Island which was fantastic, you could walk all around and underneath as the Orangutans moved above and around you. One thing that is really special about Singapore Zoo is how cleverly the enclosures are designed to remove as many barriers as possible between you and the animals, and it's great to watch them in a more natural environment. In the Fragile Forest exhibit you can walk among free ranging creatures like these beautiful toucans, which we all loved. We also spent a great deal of time watching the Giant Tortoises. They had just been fed and they made such a racket while they were crunching on their vegetables. They are such fascinating creatures. Another highlight of our visit was the Elephants at Work and Play show which takes place twice daily. We watched the elephants carry out a range of tasks from delicately picking up a coin with their trunk to moving a massive tree trunk, all the while seeing the bond that they have with their riders, the mahouts. It was fascinating, and much better than the usual watching an elephant just walking around their enclosure. There was so much to see, and you can get more of an idea from the short video at the bottom of this post. Finally I have to include a quick snap from the toilets which I loved - what a great view to have as you are washing your hands! Singapore Zoo closes at 6pm and The Night Safari opens at 7.15pm with the first show starting at 7.30pm, so you have time to grab something to eat in between from a choice of food outlets. The two zoos are just a few minutes walk away from each other, and because the first show can be busy it's worth making sure that arrive early to secure your seats. Just outside the entrance there was a zookeeper with a snake that you could meet and touch, fascinating for the little ones! Then we headed to the Creatures of the Night show - a 20 minute show which highlights the natural abilities of some of the most fascinating animals. We loved the show, it was a great mixture of fierce animals and the more cuddly and tame creatures, with plenty of humour. I wasn't able to take any photos as the amphitheare is kept dimly lit, but you can get a good feel for the show from the short video below! After the show we boarded a tram for the Tram Safari Experience. This 40 minute tour takes you through six geographical zones of the world, with plenty to see along the way. The tram guide took us through what we were seeing and pointed out the animals that were hiding in the shadows. After the tram ride there are a number of self-guided walks that you can take through the zoo. It's dark, but there is dim lighting and staff to help you find your way. We took the Wallaby Trail, inspired by the unique wildlife of the Australian Outback and highland forests. The zoo is so well designed that especially at night you can't always make out the fences and so it really does feel at points as though you are right there among the animals, and there are also quite a few free ranging animals to spot. We also did the Fishing Cat Trail, featuring some native species from the jungles of Singapore. The walking trails are the perfect length, each one takes about twenty minutes but you can spend as long as you want enjoying the animals at the time of day that suits them best. We had a great day and although it was long day it was fantastic to be able to combine both zoos in one visit. 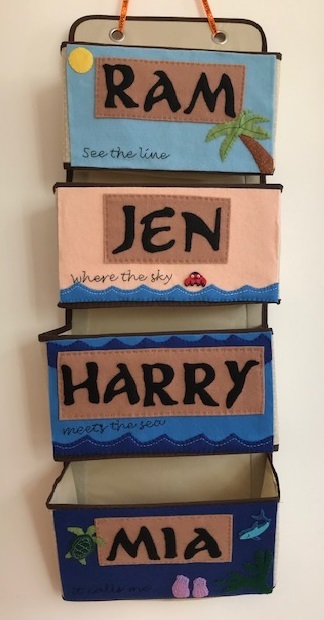 If you are visiting Singapore, whether with or without children, I'd absolutely recommend a visit, I definitely think that the zoos are one of the must-see Singapore attractions. We were provided with complimentary family entry to Singapore Zoo and the Night Safari in exchange for this review. You can find full details, including entry prices and opening times, here on the Wildlife Reserves Singapore website, as well as further information about the other parks in the group - the River Safari and the Jurong Bird Park.